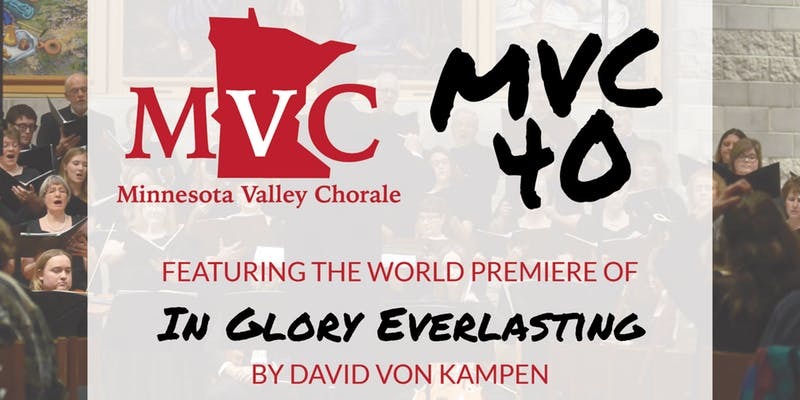 This November, the Minnesota Valley Chorale will present its 4oth Anniversary Concerts, MVC 40. The concerts will be held Saturday, November 17th at Bethany Lutheran College’s Trinity Chapel beginning at 7 p.m. and Sunday, November 18th at St. John the Baptist Catholic Church beginning at 3 p.m.
Join the Chorale as it performs many of its favorite pieces from the last 40 years of song. Works include O Day Full of Grace by F. Melius Christiansen, The Seal Lullaby by Eric Whitacre, Randall Thompson’s Alleluia and Have Ye Not Heard/Ye Shall Have a Song. Additionally, the Chorale is proud to present music from local composers Eric Barnum (The Lady in the Water) and David Dickau (O, My Luve’s Like a Red, Red Rose). The Chorale would also like to thank its supporters for contributing to the development of a new work especially for the 40th anniversary. In Glory Everlasting is a four-movement work by composer David Von Kampen. We are excited to present its world premiere at our concerts. Tickets are available from any Chorale member, or online from our ticketing page. Tickets are $10 in advance, or $12 at the door. Respond to our event on Facebook and share the event with your friends. MVC is currently directed by Dr. Eric Harstad. Harstad has been the Director of the Minnesota Valley Chorale since 2012. He earned an Associate of Arts degree from Bethany Lutheran College, a Bachelor of Music Degree from Saint Olaf College and a Master of Music degree from Minnesota State University-Mankato. Harstad earned his Doctorate in Choral Conducting at the University of Nebraska-Lincoln. The Minnesota Valley Chorale is a leader in singing varied, rich, and timeless choral music to inspire and enrich singers and audiences through practice, performance, and partnership.